Refined and soulful creativity elegantly infused with deep travel inspiration is the soul of Etro clothing. 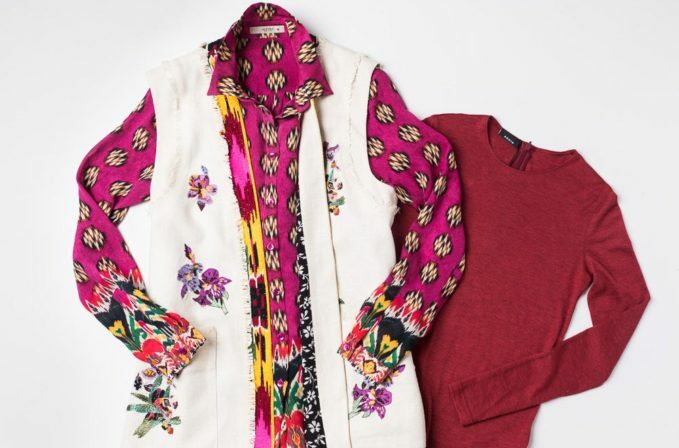 Ikat, which has history in multiple parts of the world, inspired patterns that are used in the Etro pink silk shirt and along the Etro white vest in the form of beadwork. Etro clothing has intricacies such as embroidery and beadwork, as well as detailed patterning. To alternate the top, allowing the vest to be the focus, it can be layered over a solid color shirt.